These are high pressure firefighting units designed for flexibility. As they are not specific to a vehicle they can be towed to and from locations with any number of different vehicles. Being mobile they are able to transport large volumes of water to any area that may require it and the unit is able to be left in a designated area without losing the use of a vehicle. 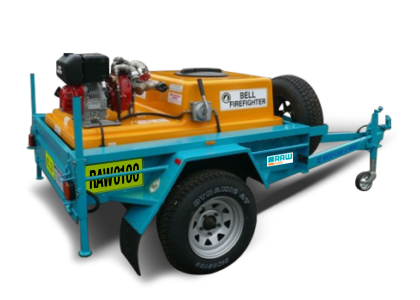 Licensed, single axle, heavy duty trailer with 205R16 x 8 ply tyres on 5 stud Landcruiser wheels with spare, upgraded suspension, cable disc override brakes, fibreglass equipment locker, front tilt-up jockey wheel, rear stabilizer jacks and timber wheel chocks. Bellglass Heatseeker fully baffled 6/700lt capacity fibreglass tank 6.5hp (4.4 KW) Honda water pump Integral engine oil drain valve, hose and plug fitted to pumpset 40mm full flow CB valve, hose with stainless fittings Camlock suction and BIC discharge couplings (or choice) 25mm valve control to reel and driver’s door hose outlet with storz adaptor 20m x 20mm HP rubber hose on lightweight spun aluminium Bell Reel with blackout FD/20 variable control nozzle with 25mm storz coupling 5m x 40mm suction hose kit with brass foot valve 7.5m x 38mm layflat tree hose/twin tip nozzle kit 5m x 20mm HP rubber driver’s door hose/hose reel extension kit with storz coupling 20 litre foam container.